Summer Time; A time for some light hearted stitching. While enjoying the summer weather, we all like to take life less seriously, even if we are a dedicated stitcher. Lets leave counting squares on cross stitch charts and stitching with wool threads for when the weather is inclement and we are stuck indoors. Instead, why not try Silk Flower Conversion just for the novelty and the fun of it. This is described in more detail in my last book, Stitching Idyllic: Hand Stitch Recognizable Summer Flowers but you can try it out using only the directions here. I thank Pat Harwood for these examples and for letting me publish them again. 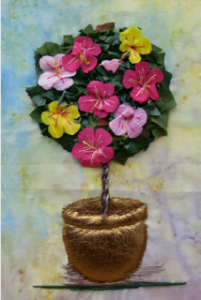 Artificial silk flowers are available in dollar stores and in craft stores such as Michaels. They are made of a textile. Look closely and you will see the weave. This make them relevant to Textile Arts. It is better to purchase better quality flowers that have a bit more body to them. The flimsy ones are harder to work with. Have an idea of what you would like to make and then go to the store and purchase one spray only of each of the flowers you are going to play with and change in some way to be something else. It is easy to get carried away by the huge variety of flowers available. Though I have not yet tried it, I think that the flowers could be painted with acrylic paints if you wish to colour the edges of the petals for instance. You may even have some of these flowers already. They may need a wash first! Hibiscus Blossoms are bright and vivid. They thrive in the Caribbean Islands and remind us of vacation time. We try to grow them in our northern houses but they usually do not thrive though may last a few years. Pat used the petals of tulip and lily flowers both of which are large and can be cut up to be changed to whatever is needed. The background is a piece of multi-coloured batik cotton. The large pot is padded and covered with bronze leather. The trunk of the tree is a cord of twisted DMC Floss. Behind the tree is a circle of felt covered with dark green cotton. This is the first time Pat has worked with leather, padding and twisted cord. In fact, everything about this project was a first for her. Draw circles 1″ in diameter (or the size you choose) on the reverse side of the petal you are using. Avoid the thick part at the base of the petal. Because it is on the reverse side, you can use a pencil or a ball point pen for this. Cut them out, fold in half and mark the edges of the petals as indicated in the second diagram. Unfold. Snip a short distance inward toward the center five times as shown. Snip right to the centre on the sixth cut. All one colour flowers are good as are several different colours. Now you are ready to stitch them in place. Use one thread of Floss and a fine needle such as Crewel 9. Overlap the two petals with the long cut between them making a five petaled flower. Attach to the tree with some small stitches along the join line. If the thread is a suitable colour, you can use it shade the centre of each petal. An alternative way of doing this is to overlap the two petals and secure the join while the flower is still in your hand. Pat added stamens using Pistil stitch. The pattern for the leaves is on the right. Cut as many as you need to cover the backing fabric and secure using two stitches invisibly under the flowers or other leaves. Pat’s second creation bears no resemblance to anything grown by nature. It is in the section on Funtasy Flowers. When using artificial silk flowers, you can do anything you want. How nice to be as free as your fancy. She used an artist canvas, available at a craft store, as a base. Purple cotton was secured onto this. She laid a variety of blossoms out on her table and played with them. This is the result. There was a need for a connection between the lower and upper parts. The path achieves this. Pat couched it down with a variegated wool thread. When the final flower spacing was decided, she applied small dabs of glue to secure the flowers and leaves in place and then attached them with small invisible stitches. You may not notice this, but she couched a feathery green braid to the edge of the path to indicate grass edging. The purple variegated wool edging contained and finished the project. Look at this piece carefully. Notice the balance and triangulation of colour, how textures are varied and that there is a lot of interest for the eye. This piece is worth looking at carefully as the construction, detail and balance are worth it. If you do not like what you create, put it away for 4 – 6 months. The time gap changes subjective vision to objective vision and you will see your creation as other people do. This is a good technique for greeting cards. You may find even the smaller flowers a bit large, Trim them or use a larger card. Anything is possible with these two techniques. Try them and, have some summer fun. 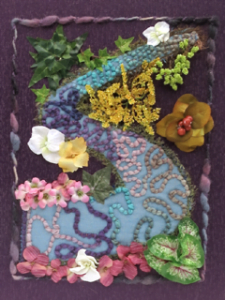 Further news from here is that Hand Stitching Recognizable Spring Flowers 2nd edition should be available very soon. You will hear when it happens on this blog. There is a huge amount of work in getting a book ready for publishing. I have also been sick again which slows me down and is annoying. I am allergic to many medications and infections keep coming back. Today is a much better day though my typing is horribly inaccurate. Thank you to Pat for letting me share this with a wider audience of readers.